I Love You More Than Carrots: Wee One Wednesday: Grass Fail. Yesterday, Carter and I ventured outside for the very first time sans blanket. I took one look at the plush, green lawn and plopped him down. He wasn't thrilled, although he didn't hate it either, but I'll be damned if I could get the kid to smile! I wonder what the neighbors are thinking as they drive by and I'm outside in my mom-uniform, bra-less sporting black yoga capris and a hotpink tank top. Did I mention I'm waving toys above my head and clapping hands every .3 seconds? I'm surprised no one has called the police. Oh I love his little expression about the grass! So cute! These are too cute! Kate tries to eat grass whenever she is set in it. 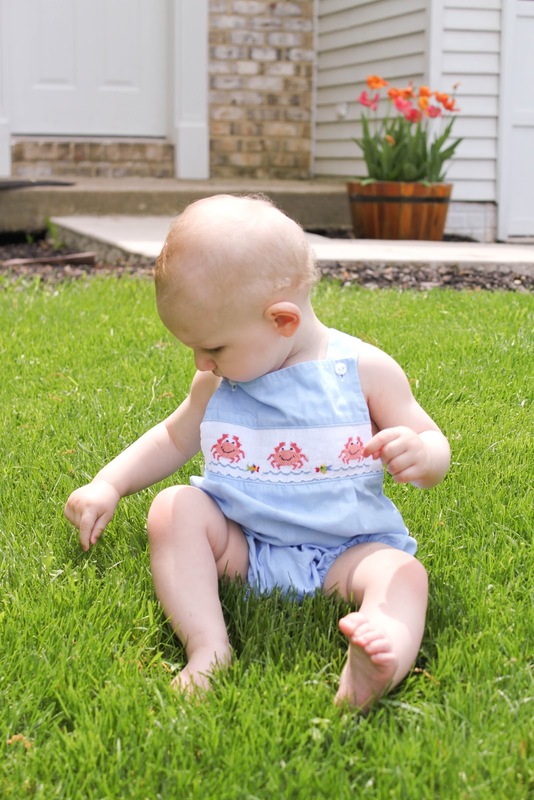 And, I adore this smocked romper - SO cute!!!! And, even cuter on your little man! I agree that the romper is adorable. Where did you find it? I wish we lived close! I would totally design your landscaping after doing ours. Plus, Adam's boss is a licensed landscaper. He does jobs on the side. SO I guess you need to move to Illinois!! Oh, and thanks for the visual of a bra-less tank top wearing AP.. :shudder: ha! Those faces are way too funny! He's like "what the heck is this mom?". His outfit is adorable! So cute. I think I have a picture of me about the same age as Carter doing the feet up pose in the grass. 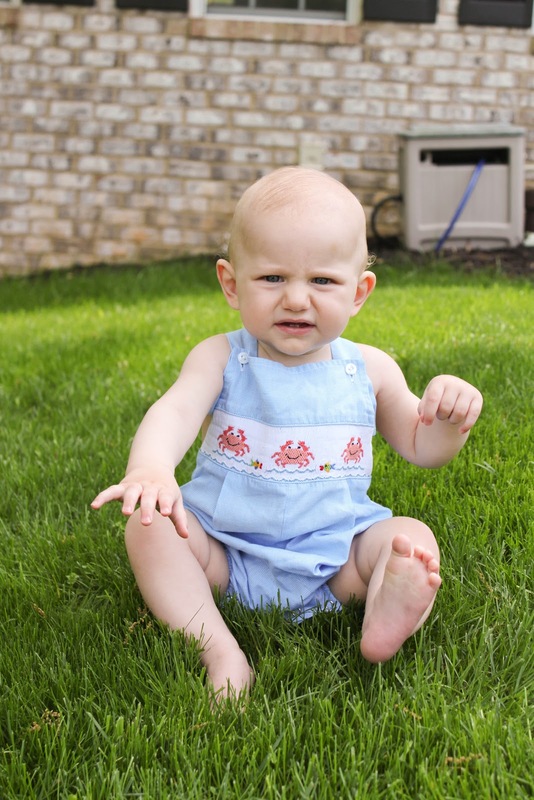 I took 61 photos of Eva's first encounter with grass. She is not looking at the camera or smiling in any of them. Not at the same time anyway. She did look a few times but there were definitely no smiles. I'm planning on trying again and if I have any better luck, I will just lie and say that was the first time, mkay? 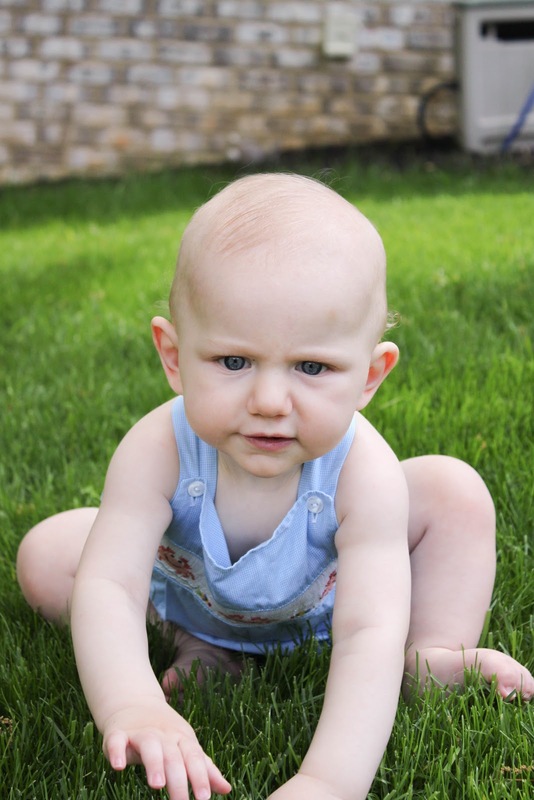 I love babies expression when they sit in grass!!! :) He is the cutest. I just love the way you blog, Ashley! Not so sure about that grass right? Eeek! But he's still so dang cute! Adorable! Great shots capturing this first spring memory. Too cute! Ok I so thought C was bald! This? Totes proves me wrong! Love it! Costs about the same usually! totally laughing at the visual of yoga pants and clapping to get a picture! Jamie hates grass. Hates. Like screams the minute I even think about putting him down. So much for letting him play outside while I water the flowers! T doesn't like grass on his legs! He is fine if he has pants on... But shorts.. Oh lawd no! Melt down! But BTB and I are convinced to get him passed this..
Loving Carters sweet outfit.. Just wish you would of posted one with you in the mommy uniform! :) ha! BG used to HATE the feel of grass. She'd just sit there with her hands in the air and give me horrified looks. But she's getting better. Love the jon jon, the blond curls, the pictures, the image of a crazy mom.. love it all! !